1) The last time these two met back on December 8, Manchester City were still unbeaten in the league, yet found themselves two points behind Liverpool, who had battered Bournemouth in the earlier fixture. Chelsea’s 2-0 victory in that game turned the title race in Liverpool’s favour, and suddenly City seemed beatable – a feeling that has been vindicated in the interim by their surprise defeats to Crystal Palace, Leicester and Newcastle. Those four defeats in the space of nine league games were more than City had suffered in their previous 70 league games. To say City would therefore be out for revenge in this game would be overegging it a little – it’s not like Chelsea won by tying City’s players to a railway track before running away cackling maniacally – but Pep Guardiola and his side would have been acutely aware that they were entering into a must-win contest they had already lost once before, albeit away from home. It is a testament to City that those facts were never once apparent from the very beginning. If that December defeat was the result that cast doubt on their credentials, then this win reasserted them in incredible style. 2) The only real surprise in either of the two lineups was Guardiola’s selection of Oleksandr Zinchenko at left-back, rather than makeshift full-back Aymeric Laporte, who returned to centre-back. Apparently Pep shared Alex Keble’s concerns about N’Golo Kante’s counter-attacking threat. This was only Zinchenko’s fourth league appearance of the season and his first since December; the other sides he has faced this season are the south coast trio of Brighton, Bournemouth and Southampton. Interestingly, Zinchenko also started this fixture last season, a game that ended in a 1-0 win for City; and although hardly given the most difficult of afternoons, he nonetheless passed this test with flying colours, even picking up two assists along the way. 3) The less said about Zinchenko’s opposite number the better, really. He was far from the only one, but Marcos Alonso was utterly horrendous for Chelsea, and it was his utterly insane error in the fourth minute that allowed City to begin their irresistible day in front of goal. Pointing for a teammate to cover a vacant space and then wandering off before seeing that they do is the kind of thing a teenager would do; the footballing equivalent of throwing a basketball squarely at someone’s head while shouting “duck!” and then defending yourself by saying “well, I told you to duck”. That’s precisely what Alonso did: as Kevin De Bruyne prepared to take a free kick just inside the final third, the Chelsea left-back wandered negligently away from the clear and obvious threat of Bernardo Silva down the right while signalling for Eden Hazard to cover him. De Bruyne spotted it and played in Bernardo before Hazard had a chance to comply, and the Portuguese’s deflected cross fell nicely for Raheem Sterling to finish. 4) That error was especially egregious because we have already seen this season – most recently in their 2-0 defeat to Arsenal – that when things don’t go Chelsea’s way early on, they collapse spectacularly. Sarri’s entire gameplan seems to be to keep things tight in the first 15 minutes or so, then pass pass pass the opposition into submission over the following 75. It worked to good effect against City in their previous meeting, but this game had more in common with that atrocious start against the Gunners than their assured December performance at Stamford Bridge. From the moment Sterling’s shot hit the net, you sensed another implosion was coming. 5) Chelsea already seemed headed for oblivion with their performance, but lively City gave them a good, firm shove into the abyss with their own. From the very first minute, they pressed and hassled Chelsea to breaking point, and while that early action did not directly force dangerous errors in the form of, say, dodgy short backpasses or players slipping onto their behinds, it was plain to see that Chelsea were irretrievably rattled. It was like watching Road Runner incessantly toy with Wile E Coyote, driving him to such fevered confusion that he becomes the instrument of his own destruction. Even the potentially huge let-off of Sergio Aguero’s missed sitter in the eighth minute didn’t give them any respite from the torment. 6) The Argentine made up for that in some style five minutes later, though. Zinchenko chased down the ball after losing it and got the better of the 50-50 ball, which broke to Aguero 25 yards from goal. 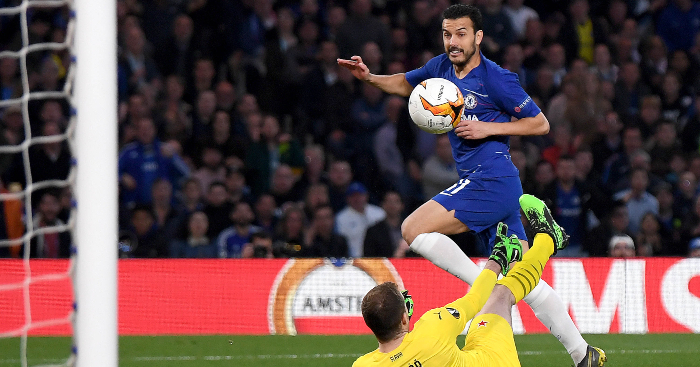 Two blinks of the eye later, the ball hit the top corner, with Antonio Rudiger’s attempted tackle and Kepa Arrizabalaga’s fingertip touch both utterly in vain. 7) …but you still shouldn’t just gift him one-on-one opportunities inside your own box. Oh Ross Barkley. That was no way to mark your first start against a top six side since the first day of the season. Zinchenko’s dinked cross was headed away by David Luiz, but Barkley inexplicably rose to nod the ball back towards goal and into the path of the alert Aguero, who tapped home the simplest of finishes. Simple, but also significant: this was the goal that put Aguero clear at the top of the list of City’s all-time league goalscorers, ahead of inter-war pair Eric Brook and Tommy Johnson. A phenomenal achievement, and not the last time in this game that Aguero would enter his name at the top of a list in the record books. 8) With less than 25 minutes gone, City made it four. Sterling’s cross for Aguero was cleared only as far as Ilkay Gundogan, who smacked it into the bottom corner – again via Kepa’s fingertips. The quality of Aguero’s first strike meant no blame was attached to the Chelsea goalkeeper, but he should have done better with Gundogan’s. Those low drives to the bottom corner appear to be something of an Achilles heel for Kepa, who was also caught out in similar fashion in the 3-2 win over Arsenal on the opening day. Kepa is only 24, which is young for a top-level goalkeeper, so this should not be read as a massive criticism, especially since Chelsea have much bigger issues to solve. But it is again instructive of a Chelsea side made up of very talented players who nonetheless exhibit a bewildering variety of glass jaws and fatal flaws. They are little more than a tough-looking end-of-level boss covered in glowing red targets that scream “HIT ME HERE”. 9) That isn’t helped by their inability to change things up even when it is extremely apparent that things are not going their way – an issue that begins on the pitch and extends to the dugout. Sticking to your principles is all well and good, particularly when trying to build a long-term project; but no matter how good your side, there will always be occasions when you must adapt in the name of short-term gains. Chelsea seem totally incapable of doing that, and even with the recent addition of Gonzalo Higuain, they remain entirely predictable. Predictability is a luxury that the best sides earn by being too good to deal with regardless. Chelsea are at nothing like that level, especially away from home – they are still without an away win in 2019 – and so Sarri’s inflexibility is nothing but a detriment to him and turns him into an all-too-easy scapegoat for the players and the fans. That is not a defence of Sarri, by the way: it is his job to give his players nowhere to hide when they are underperforming. 10) Aguero failed to secure a perfect hat-trick – left foot, right foot, head – on the 51st minute, when his header rattled back off the crossbar, but Cesar Azpilicueta generously handed him the opportunity of a spot kick five minutes later with a needless foul on Sterling. 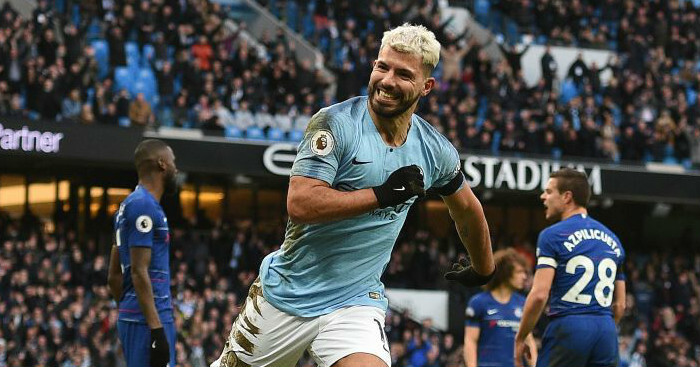 The Argentine put away the penalty to secure his second match ball in three games, having also netted three against Arsenal last week; and more significantly, it gave Aguero his 11th Premier League hat-trick, bringing him level with Alan Shearer’s record. This seems like an appropriate time to give Aguero a bit of statistical appreciation. Of the 28 men to reach 100 Premier League goals, Aguero has the best minutes-per-goal (107) and goals-per-game (0.699) records, with his goals here putting him very fractionally ahead of Harry Kane (0.697) on the latter measure. He is just 16 goals away from equalling Thierry Henry and Frank Lampard’s overall goals tally; if he maintains his scoring rate, he will have done it in six games fewer than the prolific Henry (and 359 fewer than Lampard, in case you were wondering, though it’s hardly a fair comparison). Aguero should be top-of-mind in any list of the Premier League’s greatest strikers, and at 30, could still have several good seasons left in him. What a treasure he has been for City and for the division. 11) Mike Dean, you ridiculous nob. 12) Five goals is usually the point at which a really bad afternoon becomes a complete, unutterable humiliation; so of course City went one better and made it six. Zinchenko crossed well from the left, and substitute Gabriel Jesus heeded Sterling’s shout to leave it for the England man to sweep home. That made it nine goals scored in two home games for City, ten goals conceded in two away games for Chelsea, and may well have a material effect on the league table come the end of the season. It already has for Chelsea: they have now slipped not only a point behind Manchester United, but also behind Arsenal and into sixth, with the same goal difference but having scored eight goals fewer. It also means City now hold a ten-goal advantage over Liverpool, which would only increase if Liverpool were to suffer the defeat in their game in hand that would be required to make goal difference a factor. 13) Sarri took straight off down the tunnel on the final whistle, and who can blame him, regardless of how trumped-up handshake etiquette might be in this country. Poor Gianfranco Zola was left to congratulate Guardiola while looking as bewildered as a gentle older dog who just had his dinner eaten by a cheeky young puppy. 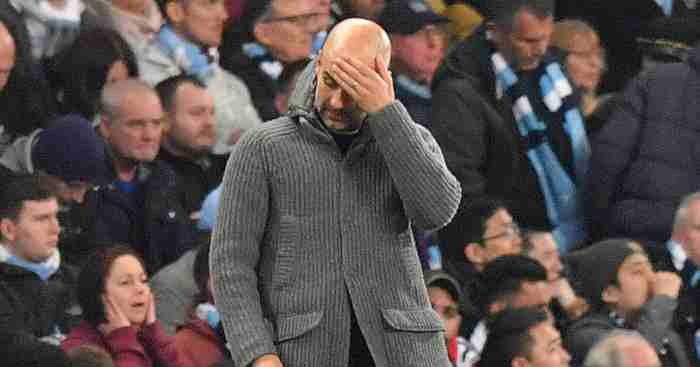 Guardiola was keen to dismiss any suggestion that he might have been offended by the Italian’s swift exit, but Sarri was less quick to poo-poo the notion that he was now under considerable pressure. He’s not daft. What remains to be seen is whether he is going to do anything differently in his approach to games; it’s going to take a hell of a pick-me-up talk to get more out of his players through sheer motivation alone. 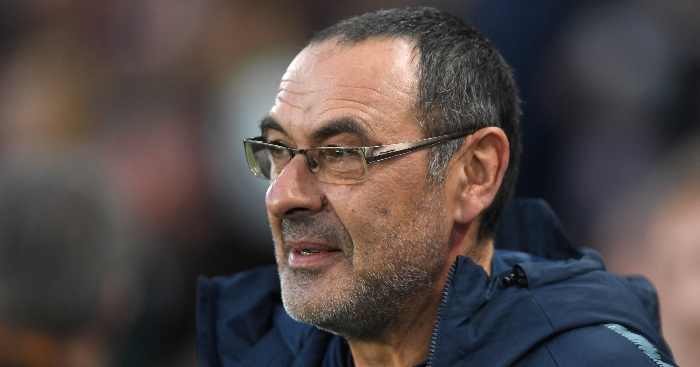 14) You especially worry about Sarri, given that his side will again come up against City in the Carabao Cup final in just a couple of weeks’ time – if he even makes it that far. We make that caution because his side have both legs of a Europa League tie against Malmo and an FA Cup game against Manchester United which, mercifully, will be played at Stamford Bridge. After that cup final, they host Tottenham in the league. Those games offer the opportunity for Chelsea to rescue themselves from an unmitigated disaster of a season, but if they continue as they have, there is a very palpable risk that they will end February will nothing left to play for and looking for a new manager. 15) Manchester City’s trajectory is quite the opposite. They are now back at the top of the table, at least for the time being, level on points with Liverpool but boasting that much-better goal difference. “To score six against Chelsea and the way we played, we had so much attention. We did it, it’s an incredible compliment to the players, they are outstanding,” said Guardiola after the game, and he was of course absolutely right to be elated. Clever-clever cynical sods like us often talk about reversion to the mean as a way to hazard people against getting carried away with the form of an overperforming side: “Bournemouth’s winning run won’t last, they’ll revert to their mean and drop back into midtable,” that kind of thing. Watching this game, it feels very much like we are about to see Manchester City return to their mean – and that means they will get back to being more ruthless, more damn tenacious, and incredibly hard to beat. 16) That would be bad news for Liverpool, of course. 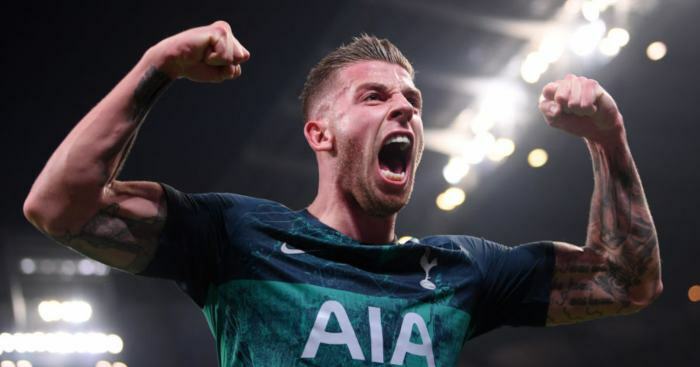 Their win over Bournemouth meant the title race would remain in their hands regardless of what happened here, but this victory was so comprehensive that the idea they might make up three points on their title rivals is not so unthinkable. With 11 or 12 games left to go, it really is too close to call. Let us not forget, either, that both City and Liverpool still have to host Tottenham in the league. 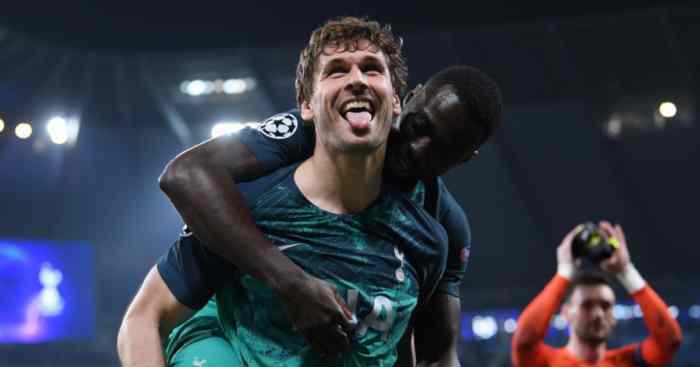 Should Spurs beat them both – or make up the points through other means – this already-thrilling title race would become a scintillating three-way.